I do hope everyone has enjoyed their long Easter breaks. we have a shorted but exciting online forex trading week and month ahead with Non-Farm Payroll, FED Chair Powell and Governor Carney speaking as well as several interest rate decisions across the varying central banks. So, it’s going to be a busy month. It’s been a while since we have opened up a live fx trading event to our non-members for NFP Market. 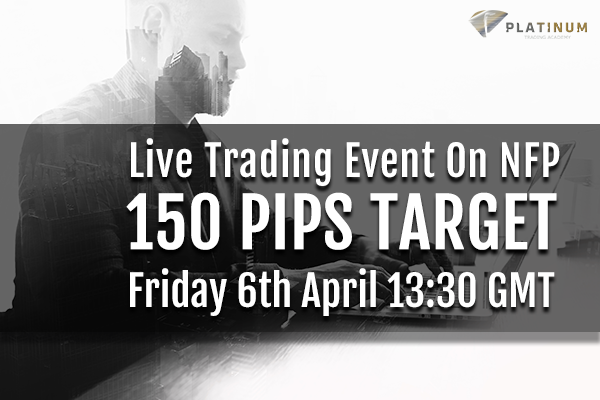 So, this week we will be running an exclusive, interactive live session with an aim to take 150 pips from this event which will, of course, focus on our Non-Farm Payroll trading strategy. If you join us for this live trading event we will be looking at how to trade the Yen and Euro during NFP. As one of the most-anticipated economic news events of the month, currency pairs (especially those involving the US dollar) typically see big price movements in the minutes and hours after the data is released. Platinum Traders always look at this as a great opportunity with a sound strategy to take advantage of the volatility. If you are new to Forex, then you need to understand that the release of the Non-Farm Payroll reports every month is a currency market moving event. The Progress of the US Economy is measured by 12 Major Fundamental Events, and the Non-Farm Payroll is a leading-indicator that measures the job-creation aspect of the Economy. Job creation is an important leading indicator of consumer spending, which in turn accounts for a majority of overall economic activity. Typically, Platinum Traders will aim for 150 pips trading this non-farm payroll event, so it certainly gets your month off to a great start when traded correctly. According to the non-farm payroll report released in March, for the month of February, the Non-Farm Employment Change produced better figures than expected, and that didn’t materially change expectations for the Economy. The February’s non-farm payroll report came out at 313K, against a forecast of 205K. Fundamental is a big part of currency trading, and Sentiment is built on currency market trends. The last Non-Farm Payroll report was a strong one, and it helped the overall picture, which is the fact that both the Economy and Labour Market are in good shape. However, the Non-Farm Payroll report to-be-released tomorrow will have its numbers affected by the aftermath of the recent trade wars that have been implemented by President Trump and China. The impact of the trade wars and regulations will probably make the use of this report very limited, and there should be no changes to policy or rate hike by the FED for the next quarter. The expected number for April in the NFP report to be released this Friday is 190K. The deviation figure to trade the Non-Farm Payroll is +50/-50. If the actual number on NFP is above 240K, compared to the estimated 190K, sell the EUR/USD with 25 pips stop loss. If the actual number on NFP is below 140K, compared to the estimated 190K, buy the EUR/USD with 25 pips stop loss. The expected number is 190k. The deviation figure to trade the Non-Farm Payroll is +50/-50. If the NFP number is above 240K, buy the USD/JPY with 25 pips stop loss. If NFP number is below 140K, sell the USD/JPY with 25 pips stop loss. Make sure you have your eyes on the clock. As soon as the news event comes out there will be a spike. TRADE NFP LIVE WITH A PLATINUM SENIOR TRADER BOOK YOUR PLACE NOW! At Platinum, we teach all individuals from different walks of life to become a full-time trader or create a secondary revenue stream by fx trading part-time. We trade in an Institutional Way by letting the currency market come to us and being patient. Using Platinum’s Trading system you can take many Pips out of the currency market. We can ensure using this style of online forex trading your currency trading will make a turnaround as you will become much more consistent. If you want to trade like the professionals do, making consistently profitable returns from your online trading, get in touch with us and we will demonstrate live exactly how we approach the currency markets.